Popping in here (in the midst of putting the finishing touches on our book manuscript, nail-biting awaiting word from publishers to whom we’ve sent our book proposal, and working with our Data Visualization Assistant on our new project website) to say that we’ve got two conference outings planned for this fall semester. If you’ll be at either, please stop in and say hi! We’re part of a roundtable session called Embedded and Engaged in Higher Education: Researching Student Entanglements with Technology, which runs from 10:15am – 12:00pm on Friday, November 22. With colleagues from four other colleges and universities who are also working on ethnographic projects in libraries, we’ll explore the role of technology for students in their academic work. We’ll also be presenting at this year’s CUNY IT Conference at John Jay. The schedule hasn’t been finalized yet, but it looks like we’re preliminarily slated for 2:15pm on Thursday, December 5 (we’ll update this post when we have the final info). We’ll also be speaking to undergraduates’ use of technology for their coursework, and the ways that student voices add detail about the college experience that can inform faculty and administrative decisions about instructional technologies. I’ve just uploaded the slides and notes from our recent presentation at Hunter College’s ACERT Teaching Tuesdays. Many thanks again to all who came to talk with us, it was a great discussion! I’ve also added slides, notes, and our paper from our conference travels last fall: MobilityShifts and the American Anthropological Association meetings. All are available on the Results & Findings page. Many thanks to our colleagues at Hunter College Libraries for inviting us to present today at the Hunter College Library Faculty Teaching & Research Forum. It was great to have the opportunity to share some of our the data from our student and faculty interviews at Hunter and to discuss our results. Thanks to all who came to the program! I’ve just uploaded our slides under Results & Findings. 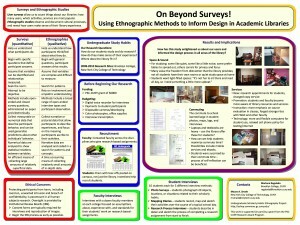 The new semester finds us busier than ever with the Undergraduate Scholarly Habits Ethnography Project. We’ve finished collecting data at an additional 4 colleges: Borough of Manhattan Community College, Bronx Community College, City College, and Hunter College. This brings us to a total of 30 student and 10 faculty interviews at each of 6 colleges — that’s a lot of data! Our incredible research assistants have done the lion’s share of transcribing these interviews over the summer, and we are immersed in coding and beginning to analyze our data, both textual as well as photos, maps, and drawings by students. We’ve plans to emerge from our analytical cocoon a few times this fall and have two conference presentations scheduled. If you’re heading to either of these feel free to swing by and say hello. We’re presenting on Saturday, October 15 @ 1:30pm in a session entitled Progressive Digital Pedagogy: Remix, Collaboration, Crowdsourcing. Our short talk will focus on the integration of mobile technologies into the academic lives of CUNY students. We’re part of a session called Library Ethnography: Negotiating Information’s Legacy and Revolutions, which begins at 8:00am on Friday, November 18. Our paper discusses how CUNY students navigate and create their own significant spaces, and the effects on their engagement with their college experience. This Thursday, March 31, we’ll be presenting some of our results in a poster session at the ACRL 2011 National Conference in Philadelphia. We’ve collaborated with Andrew Asher and Susan Miller, the lead anthropologists from the ERIAL Project in Illinois, on this poster, and it’s been great to explore common themes across all of our data. If you’re heading to the conference, stop by the Exhibit Hall between 9:15-10:15am and say hi. And if not, take a peek at our poster and handout right here — we’ve PDFed and uploaded them to our Preliminary Results page. Our edited volume Academic Libraries for Commuter Students: Research-Based Strategies (2018) is available from ALA Editions, or take a look at the book’s Chapter 1 and Index. Our book on how CUNY students use technology in their academic work, Digital Technology as Affordance and Barrier in Higher Education (2017), is available from Palgrave Macmillan, or see the preview in Google Books. We’ve also created a website to share the visual data from our 2009-2011 research: Finding Places, Making Spaces. Since beginning our research we’ve presented our findings at numerous conferences and other venues. Selected slides and other presentation materials are below. Mapping student days: Collaborative ethnography and the student experience. (2017) Collaborative Librarianship, the results of a study at 8 institutions, co-written with Andrew Asher, Jean Amaral, Juliann Couture, Donna Lanclos, Sara Lowe, and Barbara Fister. 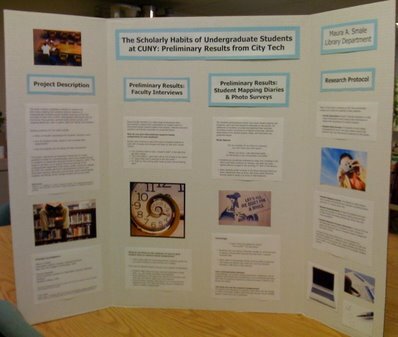 The Scholarly Habits of Undergraduates at CUNY: Preliminary Report (January 2011) presents an initial analysis of the data gathered during our 2009-2010 fieldwork. On Beyond Surveys! 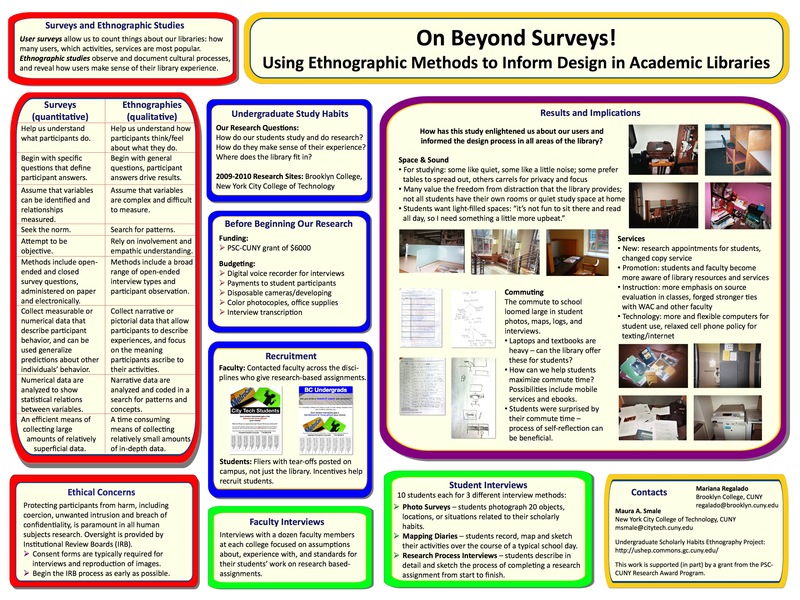 Using Ethnographic Methods to Inform Design in Academic Libraries. Poster presented at the ACRL/NY Symposium at Baruch College, December 10, 2010. Undergraduate Scholarly Habits Ethnography Project, Grace Ellen McCrann Memorial Lecture, LACUNY Spring Membership Meeting, CUNY Graduate Center, June 11, 2010. Preliminary results from City Tech were presented at the City Tech 7th Annual Poster Session of Faculty and Student Research on November 19, 2009.